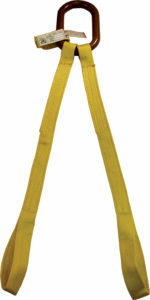 These multi-leg bridle assemblies are ideal for loads equipped with permanent lifting attachments. They’re lightweight, easy to use and economical. Choose from Scuff-Edge®, nylon or polyester. Choose from P (pear-shaped) or O (oblong) links for bridles. 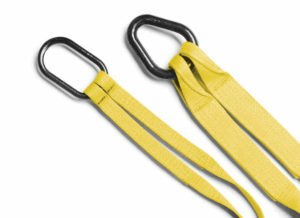 Hoist hooks and shackles are options on sling legs as well. Polyester webbing standard unless otherwise requested. Available in tow, three or four leg configurations. Link attachment: P (pear-shaped) or O (oblong) link. End attachment: SH (hook with latch), E (sewn eye), P (pear-shaped), SS (shackle) or O (oblong). For each leg you need, use a letter to designate the end attachment. For example, an “O3E” is a three-leg assembly with an alloy oblong (O) link as leg attachment and sewn eyes (E) as the end attachments for each of the three legs. Choose the length you’ll need, and add it at the end of the stock number. A pear-shaped (P) link for the leg attachment. A hook with latch (SH) on each of the two legs for the end attachment. A “-1-902” stock number representing a two-inch wide, one-ply sling.